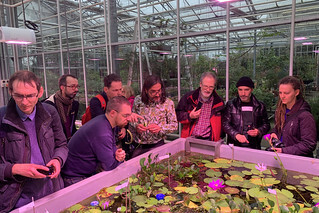 The European Waterlily and Lotus Association (EWLA), founded in 2017, held its second symposium in Kew Gardens, London. The very first EWLA symposium was held in Barcelona, in december 2017. As you might remember, that was a very heated period because the Catalan people wanted to become independent. 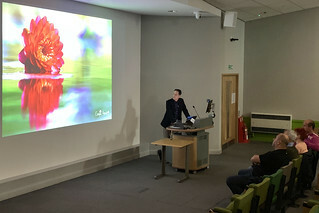 The 2019 symposium, the second one, took place in March 2019 in London. Yes, just before the deadline of the Brexit. We do love places that have a certain political vibe. At the Barcelona symposium there were around 12 people. Almost every one of them, came back for the second symposium in London. We did miss Sander Dekker though, who was at another waterlily paradise in Thailand. Luis Doblado Cañete was also not able to make it this time. Nevertheless in 2019 we had more waterlily enthusiasts that showed up. We had people from Belgium, France, Italy, Spain, the UK and even from Switzerland. It is safe to say, we start to attract more people from all over Europe. It’s always wonderful to see each other again and also meet new people face to face. This time we even had some presentations planned in the best garden of Europe, Kew Gardens. It’s useless to say that following lectures in The Lady Lisa Sainsbury Lecture Theatre is quite impressive, especially with Tomás Escribano in front, who talked about his passion for waterlilies, presented his own favourites and shared his personal experiences in growing and overwintering them in the cold winters of Madrid. Tomás was followed by Florian Henaux who let us in on his secrets of organising his hybridisation attempts and keeping track of his hundreds hybridisations a year. Kinda cool to see a spreadsheet in a presentation about waterlily hybridisations. Florian also shared his improved method with a new soil technique and proudly showed his above ground pools which were more costly to build but allow a better maintenance and heat up more easily. 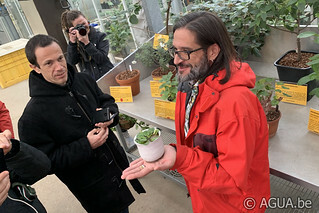 A few people from IWGS were present and James Benett was so kind to show us one of their new projects, being an up to date database on aquatic plants with the proper naming conventions and metadata. All of a sudden technology sneaked in. If passionate people talk about their passion to other enthusiasts, it’s impossible to stay on track. I have no idea how long each presentation should have taken, but I am certain they all took a while longer. So with lots of food for thought, we had to take in some real food and during lunch it was great to see hybridizers who hadn’t met before discuss their different approaches, similar issues and shared need … for fridges. Also people with nurseries shared ideas and talked about their varied seasons because of the difference in climates between southern Europe and London, the impact of continental climates versus more moderate climates on required hardiness and heat for various aquatic plants. Of course we couldn’t leave before enjoying a presentation from Carlos Magdalena about Australian species. In his very driven talk about his research into the species, their resemblances and differences across multiple growing habitats and his attempts to retrieve samples, it felt like his book came alive on stage Impressive how much there is still to study on the waterlilies of this continent. Luckily most of us already visited Kew before, because there really was no time left to just wonder around the gardens. We were fortunate though to be able to go behind the scenes of the greenhouses. We were guided by Carlos Magdalena himself through Europe, Oceania, Africa and Asia,… So many continents, so many plants. If you can’t see thermarum in its natural habitat, Kew is definitely the second best place to meet this world famous waterlily. Walking trough the greenhouse with cactus, carnivores, palms, and so many, many more beautiful plants we all quickly noticed the one greenhouse with waterlilies. After our tour in the greenhouse, we listened to the preservation presentation of Gianluca Bonomo, who was colourful even without pictures and slides And of course, we ended the day with the most important lecture of the evening, given bij Nicolas Long and Carlos Magdalena about their ambitious project. I think you will all hear about this very soon. But it was getting dark outside and time to wrap up the day with an informal dinner and some beers or gin-tonics and lots of talks about our favourite plants. Again, it was a great symposium and I think we all had a blast, so thank’s again to Nicolas Long, for organising this wonderful adventure. For more pictures on our adventure, you can click here.